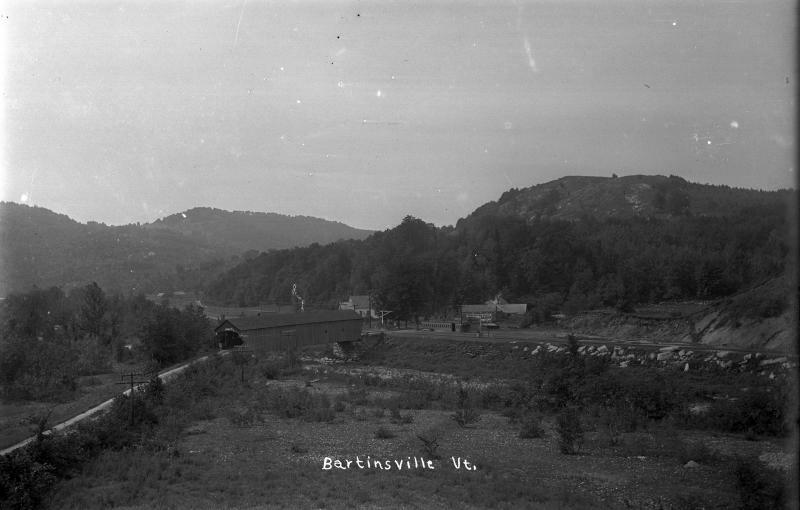 This is looking southwest towards the Bartonsville Covered Bridge. The bridge was built in 1870 after the Freshet of 1869 changed the course of the Williams River. It was lost to Hurricane Irene in 2011. Across the river you can see the Rail Car that served as a temporary Rail Road station after the old station burned down. A horse carriage is crossing the RR tracks. The Barn behind the station has an advertisement for Barnum Circus. The large white building in the center of the photos is the Spiritual Hall. Old Route 103 to Chester used to run behind the farm house. The road was relocated in the early 1960s. 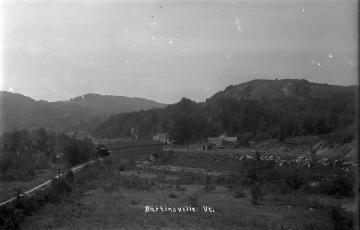 The original image is a glass slide that is owned by the Chester, VT Historical Society.